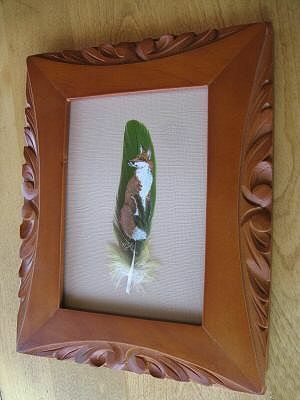 This original acrylic painting is done on a parrot feather and features a red fox. The hand carved wood frame measures about 8" x 10" and stands up for a tabletop display, and also has a hanging loop for wall display. The fox totem represents the protector and guardian of the family. Because parrots are able to mimic the speech of humans, the parrot is considered a link or bridge between humans and the natural world. Parrots have a magic that can awaken a diplomacy within and enable you to understand others more effectively. The Pueblo Indians associate parrots with the gathering of salt. Salt was a precious commodity, and the places where salt was found, were considered a gift from the sun. Anyone with a parrot totem should study colors and their effects. The parrot can be a wonderful teacher of the power of light and color. This item can be shipped internationally, but additional shipping charges may apply. Check with customs to be sure parrot feathers can be imported to your country. We are not responsible for items seized by customs agents. This product was added to our catalog on 12/20/2006.